13 August, 2012. It was a Monday. One of the more interesting features of NServiceBus is the ability to schedule messages and send messages in the future. The default implementation works well for simple cases, where you have messages that need to be sent every X seconds. But for many of our scenarios, we are more calendar based. We then used Quartz.NET as a 100% C#-based job scheduler for initiating jobs. Both of these boxes are NServiceBus hosts, but the Job Initiator is a send-only endpoint. 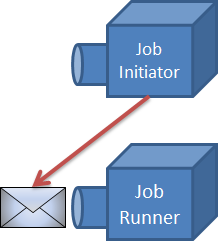 The job runners are really just NServiceBus hosts with handlers to execute the jobs. Job runners are decoupled from the schedule they run, and the job initiator is decoupled from what work actually happens as part of a job. Integrating NServiceBus and Quartz.NET is fairly straightforward, but is a little bit of code. I’ve put the full example up on my GitHub that you can download and run (readme details how). This schedule runs just once a month, on the first of the month, at 5 AM. In the sample, I also configure Quartz to use durable, database-backed schedules to be able to handle service stoppage/restarts. But why go this route instead of just normal cron/task scheduler jobs? For me, I wanted to have more reliability in my scheduled jobs, and moving to NServiceBus as the executor of those jobs gave me that. Quartz.NET then gave me the ability to host scheduling 100% in .NET, whereas the Task Scheduler API is….interesting to say the least. It’s not for everyone, but in our systems where we already have NServiceBus in use, adding Quartz.NET let us easily use messaging for job execution.